Group seeks to help nonbelievers who fear leaving LDS Church. Chris Detrick | The Salt Lake Tribune American Atheists President David Silverman speaks to atheists of Utah, ex-Mormons and disaffected, disbelieving Latter-day Saints march around Temple Square after the morning session of the 184th Annual General Conference of The Church of Jesus Christ of Latter-day Saints Sunday April 6, 2014. The American Atheists group is holding its national convention in Salt Lake City in two weeks, April 17-20. Chris Detrick | The Salt Lake Tribune Gregory Clark, center, and other atheists of Utah, ex-Mormons and disaffected, disbelieving Latter-day Saints march around Temple Square after the morning session of the 184th Annual General Conference of The Church of Jesus Christ of Latter-day Saints Sunday April 6, 2014. The American Atheists group is holding its national convention in Salt Lake City in two weeks, April 17-20. Chris Detrick | The Salt Lake Tribune John Landfair and his dog Hazel, submits his resignation from the LDS church after have being a member for nearly 22 years April 6, 2014. The American Atheists group is holding its national convention in Salt Lake City in two weeks, April 17-20. 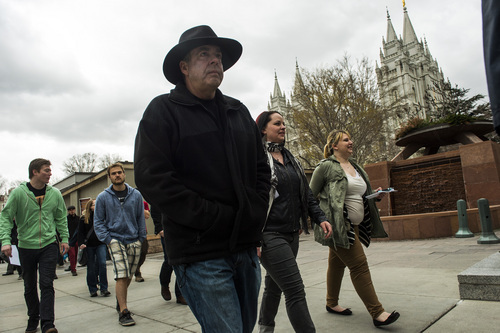 Chris Detrick | The Salt Lake Tribune Atheists of Utah, ex-Mormons and disaffected, disbelieving Latter-day Saints march around Temple Square after the morning session of the 184th Annual General Conference of The Church of Jesus Christ of Latter-day Saints Sunday April 6, 2014. The American Atheists group is holding its national convention in Salt Lake City in two weeks, April 17-20. 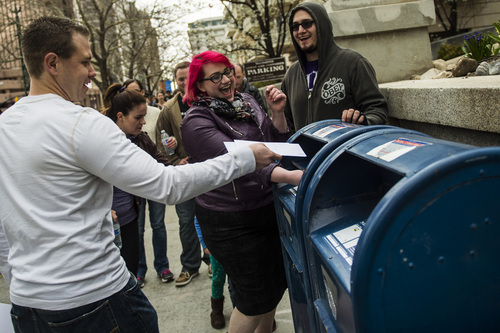 Chris Detrick | The Salt Lake Tribune Valerie Ziemski, of Salt Lake City, mails her letters resigning from the LDS Church after having been a member for 15 years April 6, 2014. The American Atheists group is holding its national convention in Salt Lake City in two weeks, April 17-20. Chris Detrick | The Salt Lake Tribune Jared Bowden, of Salt Lake City, and other Atheists of Utah, ex-Mormons and disaffected, disbelieving Latter-day Saints march around Temple Square after the morning session of the 184th Annual General Conference of The Church of Jesus Christ of Latter-day Saints Sunday April 6, 2014. The American Atheists group is holding its national convention in Salt Lake City in two weeks, April 17-20. 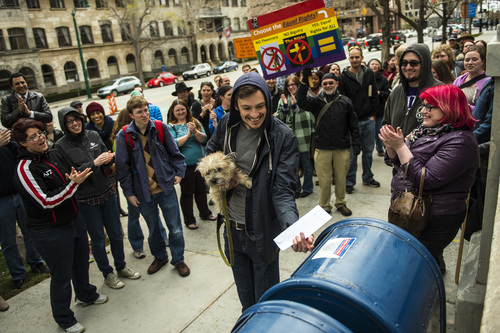 Chris Detrick | The Salt Lake Tribune Jared Bowden, Sarah Davidson and Jose Martinez along with other Atheists of Utah, ex-Mormons and disaffected, disbelieving Latter-day Saints mail their letters resigning from the LDS Church after the morning session of the 184th Annual General Conference of The Church of Jesus Christ of Latter-day Saints Sunday April 6, 2014. The American Atheists group is holding its national convention in Salt Lake City in two weeks, April 17-20. 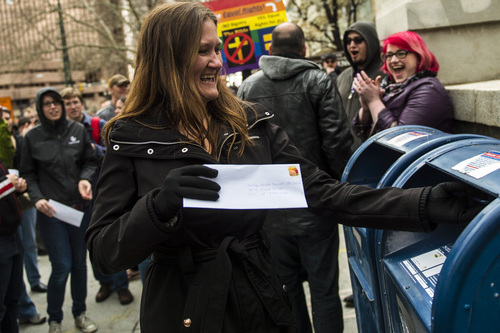 Chris Detrick | The Salt Lake Tribune Annalyn Hegemann, of Salt Lake City, mails her letters resigning from the LDS Church after having been a member for 41 years April 6, 2014. The American Atheists group is holding its national convention in Salt Lake City in two weeks, April 17-20. Chris Detrick | The Salt Lake Tribune Jared Bowden, Sarah Davidson and Jose Martinez along with other Atheists of Utah, ex-Mormons and disaffected, disbelieving Latter-day Saints march around Temple Square after the morning session of the 184th Annual General Conference of The Church of Jesus Christ of Latter-day Saints Sunday April 6, 2014. The American Atheists group is holding its national convention in Salt Lake City in two weeks, April 17-20. 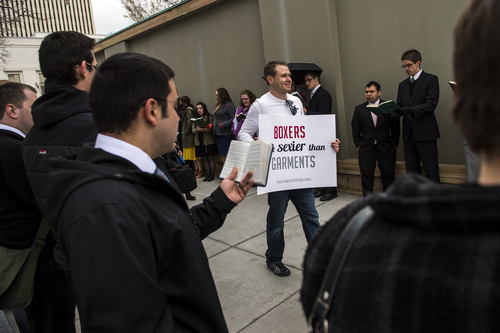 Chris Detrick | The Salt Lake Tribune Atheists of Utah, ex-Mormons and disaffected, disbelieving Latter-day Saints march around Temple Square after the morning session of the 184th Annual General Conference of The Church of Jesus Christ of Latter-day Saints Sunday April 6, 2014. The American Atheists group is holding its national convention in Salt Lake City in two weeks, April 17-20. 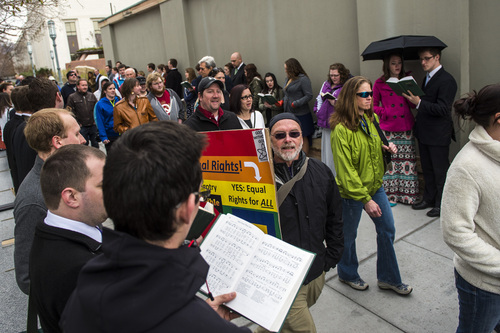 Chris Detrick | The Salt Lake Tribune Atheists of Utah, ex-Mormons and disaffected, disbelieving Latter-day Saints march around Temple Square after the morning session of the 184th Annual General Conference of The Church of Jesus Christ of Latter-day Saints Sunday April 6, 2014. The American Atheists group is holding its national convention in Salt Lake City in two weeks, April 17-20. 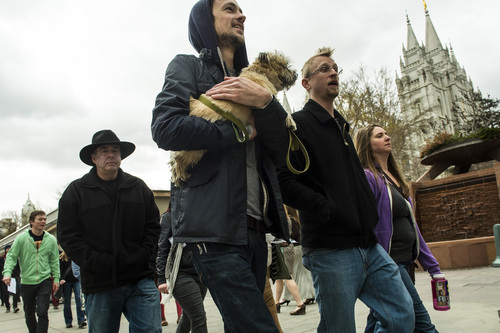 Chris Detrick | The Salt Lake Tribune John Landfair and his dog Hazel, along with other atheists of Utah, ex-Mormons and disaffected, disbelieving Latter-day Saints march around Temple Square after the morning session of the 184th Annual General Conference of The Church of Jesus Christ of Latter-day Saints Sunday April 6, 2014. The American Atheists group is holding its national convention in Salt Lake City in two weeks, April 17-20. 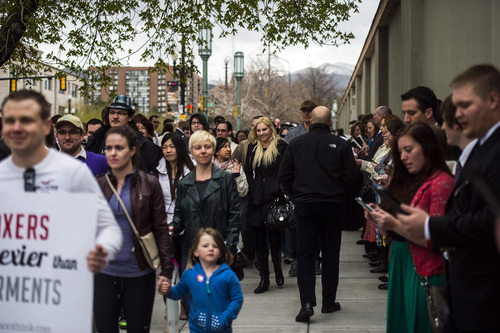 Chris Detrick | The Salt Lake Tribune Atheists of Utah, ex-Mormons and disaffected, disbelieving Latter-day Saints march around Temple Square after the morning session of the 184th Annual General Conference of The Church of Jesus Christ of Latter-day Saints Sunday April 6, 2014. The American Atheists group is holding its national convention in Salt Lake City in two weeks, April 17-20. Chris Detrick | The Salt Lake Tribune American Atheists President David Silverman speaks to atheists of Utah, ex-Mormons and disaffected, disbelieving Latter-day Saints march around Temple Square after the morning session of the 184th Annual General Conference of The Church of Jesus Christ of Latter-day Saints Sunday April 6, 2014. The American Atheists group is holding its national convention in Salt Lake City in two weeks, April 17-20. Chris Detrick | The Salt Lake Tribune Kalen Braley, of Salt Lake City, submits a letter of resignation from the LDS church on behalf of Joseph Smith April 6, 2014. The American Atheists group is holding its national convention in Salt Lake City in two weeks, April 17-20. 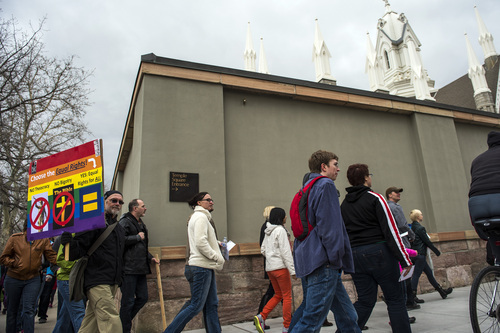 The sky grew angry over some 75 atheists as they assembled to march around downtown Salt Lake City&apos;s Temple Square during the LDS Church&apos;s General Conference. But the gathering storm had nothing to do with the wrath of the Almighty, according to the nonbelievers, because there is no God. Despite the raindrops, the crowd, led by Dan Ellis, president of Atheists of Utah, remained in high spirits. Most of the marchers were former Mormons and many mailed resignations to the LDS Church at the end of the short trek around the square. Ellis dubbed it "the Mormon exodus and mass resignation event." 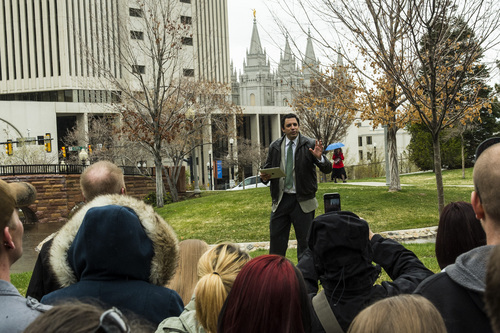 "It&apos;s our right to resign from the LDS Church and support others who would like to," he told the crowd. Among the group was Salt Lake City resident Katerina Hayes, who is 31 and has two small children. "I feel like I was forced to join the church by my parents," she said. "If I ever join a religion, I think it should be my own decision." Utahn Robert Fraham, 78, was baptized into the LDS Church at a young age and said he was sending in his resignation. "I&apos;m an equal-opportunity blasphemer. I don&apos;t think the Mormons are any worse than other religions," he said. "All those deists are idiots." Kerry Strickland, a former Southern Baptist from Jasper, Ga., moved to Utah a year ago after being shunned from her community when she came out as an atheist. 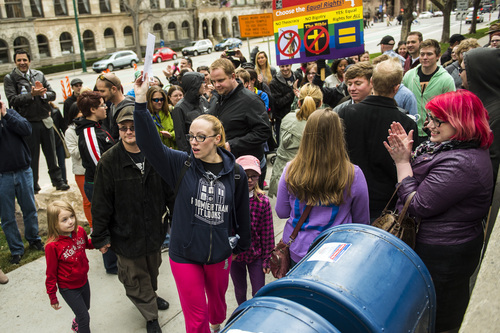 She said she was marching Sunday in support of others, including ex- Mormons. "It&apos;s hard to come out of the atheist closet when there are so many religious people in your family," she said. "From my family and community, the reaction was overwhelmingly negative." 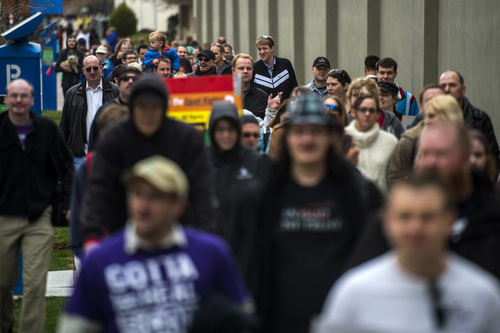 Ellis instructed the atheists to be respectful as they marched. Their walk along North Temple took them through some 100 LDS faithful along the sidewalk singing "How Great Thou Art," a hymn praising God. A young man at the end of the line of singers refused to comment on the atheists, saying only, "I&apos;m just here to sing, man." 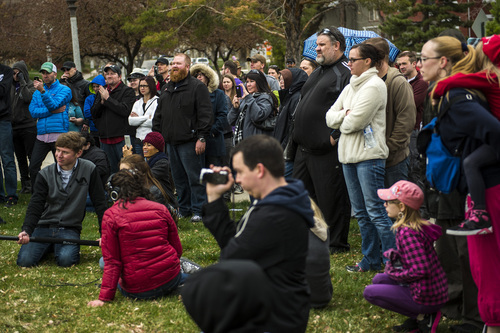 After the demonstration, the atheists gathered in City Creek Park to hear David Silverman, president of American Atheists. Mormons shun apostates, he said. But atheists welcome dissent and respect people of all religions. 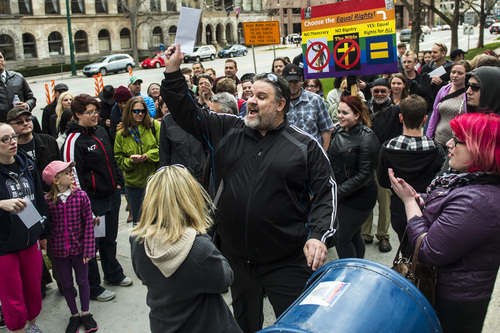 "You are making it easier on closeted atheists who are afraid to leave this church," he said. "Embracing reality means not fearing dissent." The American Atheists group will hold its national convention in Salt Lake City over the Easter weekend, April 17-20. The American Atheists&apos; national convention will be at the Hilton Salt Lake City Center, 255 S. West Temple, from April 17 to 20. Day passes are available at http://www.atheists.org.